Tracker is the add on module from Total Materia which deals with the important challenge of traceability and how to make sure that the data being used is the most up to date and therefore most reliable information available. See exactly what has changed within the Total Materia databases and when from standard version updates to property data changes. 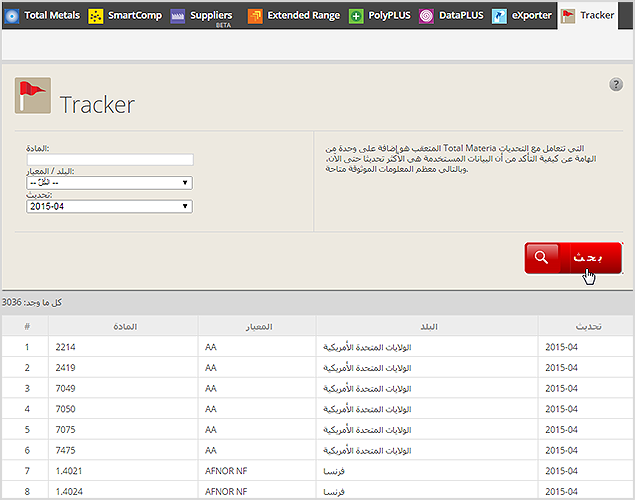 Information within the Tracker Module can be accessed in 2 ways, by clicking on the main menu Tracker tab or through the searched and selected material itself. When you first enter the Tracker module, the default results list will be set to the last update made in the database. Total Materia make updates and upgrades to the data every single month which means we provide the most up to date information resource possible. 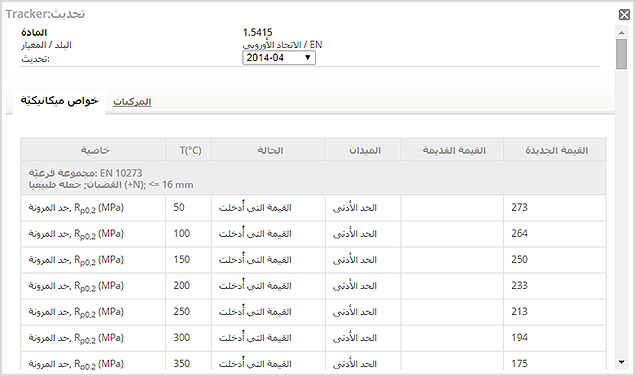 For example in April 2014 (update 2014-04) 10649 materials were updated in one way or another. Using the Tracker filter system it is possible select the update period you are most interested in. Tip: To see updates for materials from a particular standard you can also filter the results list by selecting the standard of interest in the drop down. By clicking on the material hyperlink you can then simply and quickly open the tracker window to view all associated changes for the selected material. All changes will be detailed under the specific tabs to make finding data changes quick and simple. To demonstrate the other ways to find updates to a specific material we can go to the quick search page, enter the designation and then click to the subgroup page. When viewing any material properties for this specific material you will be able to find a Tracker icon and view changes link. In brackets you can see immediately whether there are any changes to the selected material. To see the changes and enter the Tracker module it couldn't be simpler. Just click on the link and the material updates will be immediately displayed for you.